Indian Yellow Dayflower is a prostrate hairless herb. Leaves are 3-5 x 1-1.5 cm, linear-lanceshaped or linear-oblong, tip pointed, base blunt, margin fringed with hairs; sheath up to 5 cm, fringed with hairs. Flower-cluster-stalks are slender, up to 2-4 cm, rough, velvet-hairy. Spathe is 1-2 x 5-1 cm, ovate-lanceshaped, tapering, base deeply heart-shaped. 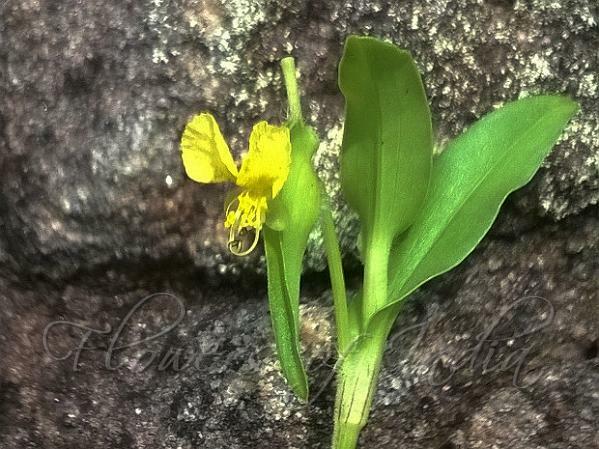 Flowers are yellow, about 2 cm across; sepals 3-4 x 3 mm, ovate, blunt. Petals are up to 10 x 5 mm; stamens 3; ovary spherical, 2-ovuled. The paired petals are kidney-shaped, yellow, medial petals small rounded or boat shaped, white or faint yellow; stamens 3, filaments yellow, anthers ellipsoid, brown; staminodes 3, yellow, antherodes cross-shaped. Capsules are spherical, 5 x 3 mm, not splitting open. 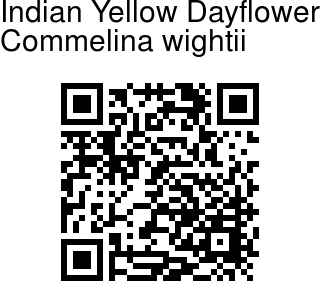 Indian Yellow Dayflower is apparently endemic to southern India: Tamil Nadu, Kerala. Flowering: August-December. Identification credit: Mohanan M.P. Photographed near Nemmara, Palakkad distt. Kerala.